When he was purportedly only ten years, seven months, and sixteen days old, Gilbert Van Zandt enlisted in the Union Army, making him one of the youngest soldiers to fight in the American Civil War. He was born on December 20, 1851, in Port William, Ohio. When he was purportedly only ten years, seven months, and sixteen days old, Gilbert Van Zandt enlisted in the Union Army, making him one of the youngest soldiers to fight in the American Civil War. He was born on December 20, 1851, in Port William, Ohio. According to many sources, Van Zandt joined Company D, Seventy-Ninth Regiment Ohio Volunteer Infantry, along with his father and uncles, in July 1861. Due to his small size, Van Zandt's mother designed a special uniform for him. Prior to joining the war, Van Zandt, hoping to encourage men to enlist, was a drummer boy at his local recruiting office. There is some dispute about when Van Zandt enlisted in the Union Army and his age. The Adjutant-General's records list Van Zandt as mustering into the Seventy-Ninth Ohio on October 31, 1862, several months later than most sources. His age at time of muster was also listed as fourteen years. There also are no other Van Zandts listed in the Adjutant-General's records in Company D of the Seventy-Ninth Ohio, suggesting that Van Zandt did not enlist with his father. Despite these discrepancies, Van Zandt was still a mere child when he enlisted in the Northern military. 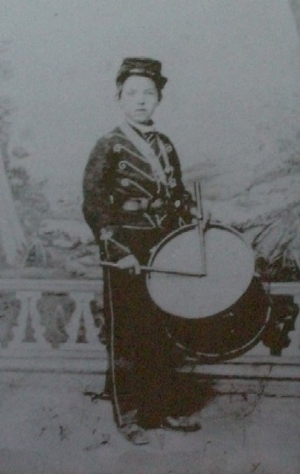 Upon enlisting in the Union Army, officials assigned Van Zandt as a drummer boy. He also served as a courier. He stayed with the Seventy-Ninth Ohio Volunteer Infantry for the entire war. He participated in William T. Sherman's Atlanta Campaign in 1864, the March to the Sea in late 1864, and the Carolina Campaign of early 1865. He mustered out with his unit on June 9, 1865. Upon the war's conclusion, the young Van Zandt met President Andrew Johnson. Johnson made the veteran two offers: he could either attend the United States Military Academy at West Point, or he could keep his pony, Fannie, which the soldier had used in the war. Van Zandt chose Fannie, and the president ordered that the horse be sent via train to Port William. On October 4, 1944, Gilbert Van Zandt died at Kansas City, Missouri. He was one of the youngest to fight in the Civil War and one of the last surviving veterans of the conflict.